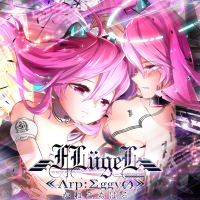 FLügeL《Λrp:ΣggyØ》 is related to Lachryma《Re:Queen’M》, from SOUND VOLTEX III GRAVITY WARS. FLügeL《Λrp:ΣggyØ》 is one of the eight The 5th KAC Original Song Contest top winners' KONAMI original songs. 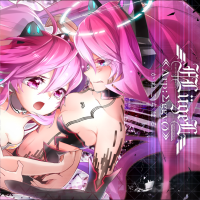 It was added to SOUND VOLTEX III GRAVITY WARS on August 17th, 2016. It's the eighth and final song of the group. 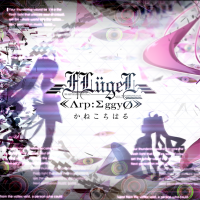 FLügeL《Λrp:ΣggyØ》 is the only unlockable song of the twenty-third episode of MISSION, 宿命を超えて. Note that MISSION Episode 22 must be completed first. Its GRAVITY chart, rated level 16, can be unlocked via INFINITE BLASTER after unlocking the GRAVITY charts for DIABLOSIS::Nāga and Lord=Crossight. As of SOUND VOLTEX IV HEAVENLY HAVEN, its NOVICE/ADVANCED/EXHAUST charts can be purchased with BLOCKs instead. RASIS and GRACE appear in FLügeL《Λrp:ΣggyØ》's jackets. The GRAVITY jacket is a modified version of the EXHAUST one, with RASIS and GRACE showing different expressions. FLügeL《Λrp:ΣggyØ》 is Kaneko Chiharu's first KONAMI original song. FLügeL《Λrp:ΣggyØ》 is read as "Flugel Arpeggio". Flugel is German for "wing". FLügeL《Λrp:ΣggyØ》 uses a special background during play, based on veRtrageS's and Lachryma《Re:Queen’M》's ones. In the second half of the song, RASIS and GRACE (as drawn in the EXHAUST/GRAVITY jackets) appear. Like in Lachryma《Re:Queen’M》, in the second half of FLügeL《Λrp:ΣggyØ》 the chart lanes become invisible until the end of the song. This time, however, the lanes disappear on all difficulties. 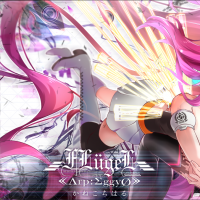 FLügeL《Λrp:ΣggyØ》 was one of the qualifying round songs in the The 6th KONAMI Arcade Championship for SOUND VOLTEX IV HEAVENLY HAVEN. This page was last edited on 27 October 2018, at 16:42.